Collecting the strips from - January 7 to June 24, 1945 (Strips 240-264). 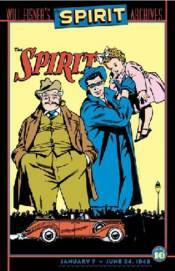 The comprehensive collection of Will Eisner's classic, award-winning saga of The Spirit continues! Volume 10 features almost 200 pages of lassic Spirit adventures, including the ghostly mystery Ellen Dolan stumbles across at the old Tenacre place; the kidnapping of a war-hero's daughter; and a gambling debt that leads to murder. The Spirit also investigates how Ebony wound up in a sultan's harem and why Commissioner Dolan harbored a criminal in his house. Plus, a portfolio of Eisner's military-related artwork produced while he was in the Army!